Like many hotels, the Lumber Baron provides guests with a comfortable place to stay, as well as a venue for weddings and other events. What the hotel also has is a whole collection of mystery dinners. Tickets for the annual mystery dinner season can be found on the inn’s website. The eponymous lumber baron was John Mouat, a Scottish immigrant who built the mansion after acquiring his fortune in the lumber industry in the 1890s. After the Mouats, the house was passed down to different families before being converted into separate apartments. This is where the horrors of the so-called mystery mansion come in. By 1970 the mansion had been converted into individual apartments. One 17-year-old from Golden, Colorado, named Cara Lee Knoche, started living in the building in September of that year. She had previously dropped out of high school. On October 12, 1970, both Knoche and Marianne Weaver, a high school friend of hers, were found dead in Knoche’s apartment. Knoche had been raped and then strangled to death. She was found naked and shoved under the bed with a knife underneath her. There were signs that she struggled with her attacker and tried to protect herself. Weaver, on the other hand, was found lying on top of the bed with a shot to the head. The police suspect she may have walked in on the murder, in turn to be murdered herself. The two girls are often thought of as the cause of any paranormal activity that happens in the building. Apparitions of young women have been seen, and the sound of footsteps has been heard. In one case the image of Weaver was thought to be seen in the reflection of a mirror photographed at the inn. In the Valentine Suite, which is where the girls were murdered, some guests have said that they felt something hovering near them. Both images and recordings of cats have been made in the Valentine Suite, even though there was no cat on the premises at the time. Some psychics who have investigated the building claim to have contacted the two women. While they did supposedly go into detail about their deaths, there was unfortunately no information about the killer. On the other hand, some of the paranormal activity is unrelated to Knoche and Weaver. Some claim that Mouat may still haunt the building. Cold spots have been felt throughout the building, and the house creaks and groans despite heavy renovation. There is also the figure of a woman in Victorian clothing that can be seen on the stairwell. Some also claim it is her shadow you see in the mirror above the fireplace in the front parlor. Some people have also claimed to see a tall woman in a blue dress from the ’20s. Additionally they can smell the cigarette smoke she leaves behind, despite a no-smoking policy in the building. The owner claimed a teenage ghost would greet him in the basement every day as well. After the murders in the ’70s, the building began to crumble. The next owners, Julie and Walter Keller, found the building in the ’90s and decided to restore it. 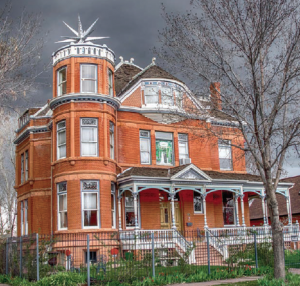 Their job was not an easy one, as the building was so dilapidated it had been condemned by the city, but it is now considered one of the best examples of original Queen Anne architecture in Denver. The Kellers did not shy away from the paranormal aspect of their hotel and hosted paranormal investigations there on many occasions. But despite booming business, they placed the Mystery Mansion back on the market in June 2014. It sold in April 2016 for $1.7 million to Elaine and Joel Bryant, who will continue to operate it as a bed-and-breakfast. 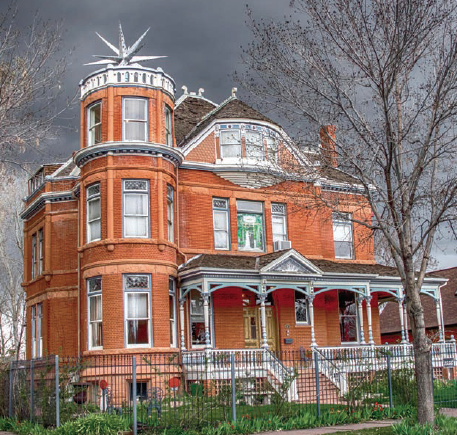 In her book Ghosthunting Colorado, Kailyn Lamb looks at locations throughout the state and dives headfirst into the history behind the ghosts and what has made them stay. Join her in investigating the history of some of Colorado’s most haunted locations, and you might find more than gold in those hills.